A Median Auction Maiden Stakes over 1m 141y. Eleven juveniles take part: just four colts against a flirt of fillies. Sicur was a relatively expensive yearling at 87,000gns and clearly held in some regard. This bay colt made his debut at Newmarket and, unusually for the stable, he was sent off 3/1 after being backed from over double those odds. Since that start, he has been placed on two further starts and damn unlucky not to have won with a short head second at Doncaster and then a quarter-length loss at Nottingham behind Sir Henry Cecil's Autun. 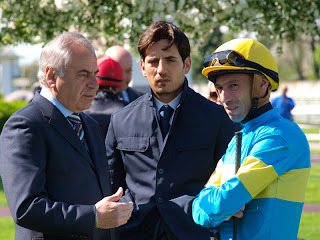 Luca Cumani and Patrick Hills have proven a strong team this season and connections - Scuderia Rencati Srl - will be expecting a big run. By all accounts this is a drop in class and he must go very well. This son of Dylan Thomas will take all the beating.